Lock in a great price for Atton Santiago El Bosque by AccorHotels – rated 8.7 by recent guests! Exellent breakfast comes with the room. Location is superb. Five minutes walk from Tobalaba metro station. Ten minutes walk to Costanera Center, upscale shopping. Hotel is in business district, many restaurants and shops in the area. Hotel is spacious. Room was clean, bed clean and comfortable, bathroom very clean and modern. Great location, comfortable and friendly staff. Breakfast was good. THE HOTEL IS CONVENIENT, EFFICIENT AND VERY CLEAN. 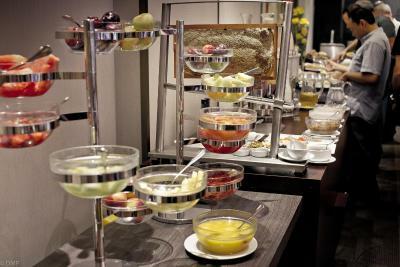 THE BREAKFAST IS VERY NICE AND WITH GOOD TIME WINDOW TO MAKE FLEXIBLE USE OF THE SERVICE. Very elegant, well run hotel. Thank you! Very good complementary breakfast! The location of the hotel is key for the rating. The service was good and the included breakfast was really very well prepared and organized. The personnel was quite efficient and capable of resolving difficulties swiftly. Breakfast was very complete, many options to take. Coffee really good. Attention at the front desk and all personal in general very good. Nice people. Support for taxi was great. Taxi on front the building very good too. Room space and confort. Close to many spots. Good location for runners. Atton Santiago El Bosque by AccorHotels This rating is a reflection of how the property compares to the industry standard when it comes to price, facilities and services available. It's based on a self-evaluation by the property. Use this rating to help choose your stay! 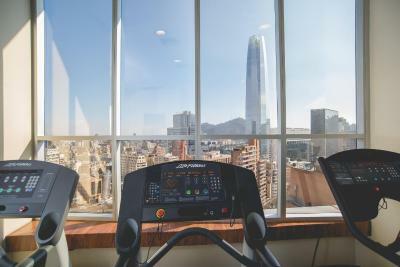 One of our top picks in Santiago.Offering modern rooms and free parking, Atton El Bosque by AccorHotels features a fitness center and swimming pool on the 18th floor with city views. 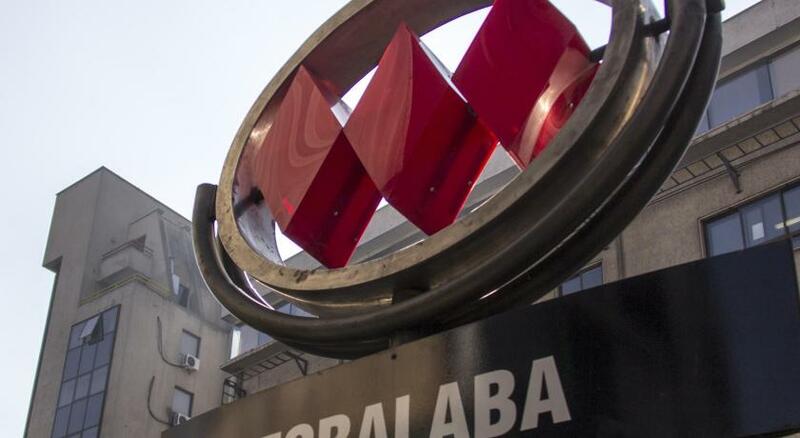 Tobalaba Metro Station and Costanera Center shopping mall are only 1,150 feet away. Free WiFi is available in all guest rooms and public areas. Spacious and designed with delicate colors, each room has cable TV, a work desk and a mini bar. All rooms are nonsmoking, and offer private bathrooms. 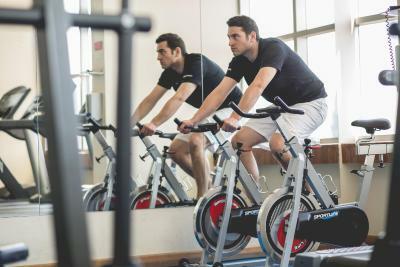 The 24-hour fitness center offers views of Santiago city. Located in El Golf district, Atton El Bosque by AccorHotels is a 25-minute car ride from Arturo Merino Benitez International Airport. 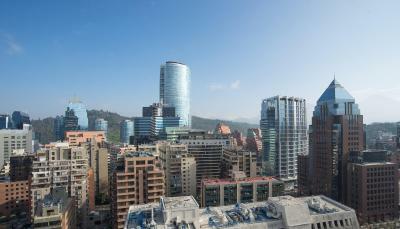 Las Condes is a great choice for travelers interested in seafood, restaurants and food. This is our guests' favorite part of Santiago, according to independent reviews. When would you like to stay at Atton Santiago El Bosque by AccorHotels? This spacious suite features a private bathroom, LCD TV, king bed, sitting area, minibar, free Wi-Fi and a safe. Some room feature panoramic views of the Andes mountain range. This spacious room features a private bathroom, LCD TV, king bed, minibar, free Wi-Fi and a safe. Some room feature panoramic views of the Andes mountain range. This spacious room features a private bathroom, LCD TV, minibar, free Wi-Fi and a safe. Some room feature panoramic views of the Andes mountain range. Atton El Bosque was established in 2007 and features a privileged location, only 2 blocks away from Tobalaba Metro Station and steps away from El Golf business district. It is the perfect place to stay during your visit to Santiago, whether it be for business or for pleasure. We are committed to providing an efficient and cordial service, so that our guests wish to return in the future. Hotel surroundings – This neighborhood is a great choice for travelers interested in seafood, restaurants and food – Check location Excellent location – show map Guests loved walking around the neighborhood! 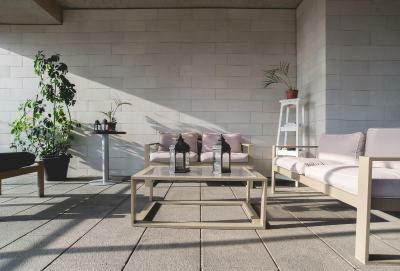 House Rules Atton Santiago El Bosque by AccorHotels takes special requests – add in the next step! All older children or adults are charged USD 60 per person per night for extra beds. Atton Santiago El Bosque by AccorHotels accepts these cards and reserves the right to temporarily hold an amount prior to arrival. Based on local tax laws, all Chilean citizens and resident foreigners must pay an additional fee (IVA) of 19%. To be exempt from this 19% additional fee (IVA) the payment must be made in US dollars and a copy of the immigration card and passport must be presented. The passenger won’t be exempt from this fee when paying in local currency. In case of no show the invoice will be billed in local currency, including this additional fee (IVA). * This additional fee (IVA) is not included in the hotel rates and must be paid separately. Wifi could be better and quality of the coffee for the breakfast at least. Nice hotel for a stop over. Beds were very comfortable and breakfast was great. Without complimentary bootle(s) water in room Breakfast good three stars hotel, nothing more, but good Maybe better cafe? No matter what time of the day we walked into our room (611), there was a musty, like dirty socks/wet dog smell in the air...We figured maybe it was only because air wasn't turned on just yet, but after a couple of days we figured it's perhaps the carpet in the room that needs to be replaced with a different type of surface (that doesn't trap smells). 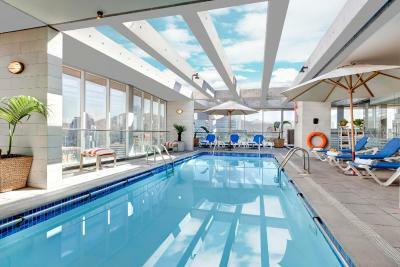 Rooftop pool was a great amenity to use. 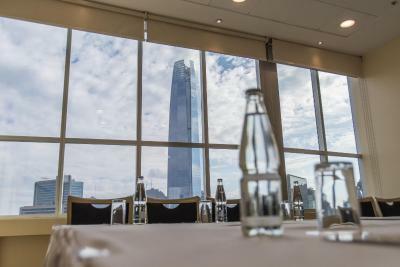 Free parking was very convenient as the hotel is right in the heart of one of Santiago's business centers. I had a large room with a superb view over the city. Everything well-appointed and clean. Large bathroom, large clean towels etc. etc. the room was great. Really abundant breakfast too, with yummy eggs and cakes. Plus a star location in the Las Condes area. Would definitely come here again. The bathrooms are somewhat dated. Could do with coffee/tea making facilities in the room. Also would appreciate complimentary bottles of water. THEY SHOULD SERIOUSLY CONSIDER ADDING A HOT UG IN THE ROOM SO THAT YOU CAN BREW SOME COFFEE AND/OR TEA . Close walking distance to some nice restaurants in pleasant part of the city. Breakfast above average. Quiet location. Good value. Great staff they were very professional. Superb location. Spacious comfortable clean rooms. Comfortable bed. Fast and reliable wifi. Excellent courteous staff. Enormous choice for breakfast. Reasonably priced food and wine for lunch and dinner.